Put on your spectacles and your thinking caps, people. You may be about to learn something. Epsom salt is NOT ACTUALLY A SALT. That’s right. That white salt stuff that you’ve heard so much about is not a salt at all. It’s magnesium sulfate, with no sodium. But nevertheless, it’s amazing stuff. 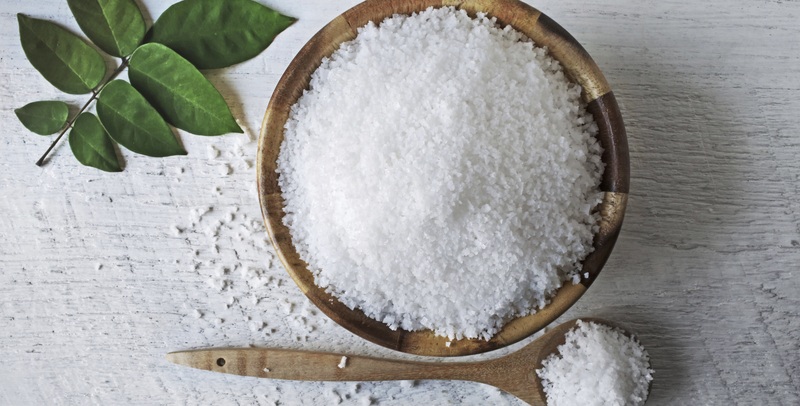 Long known as a natural remedy, Epsom salt is named for a salt spring in Surrey, England. Both magnesium and sulfate can be absorbed through the skin, meaning a warm bath in dissolved Epsom salt can bring a wealth of benefits. Magnesium is a clever little mineral that gets an A+ for all of its hard work, like assisting in muscle and nerve function, regulating blood sugar and blood pressure levels, and making protein, bone and DNA. And when you’re stressed, your magnesium levels can drop. A soak in a hot bath with a few scoops of Epsom salt can not only raise your magnesium levels, it can wash your stress away. Epsom salt can help relieve pain and inflammation in tired joints. Are your feet a bit achey and sad? Fill a tub with warm water and Epsom salt and give them a well-deserved break. Then give them a good rub, paint your toenails a pretty shade, and you’ll feel like a brand new person. Believe it or not, a couple of teaspoons of Epsom salt can help relieve constipation and assist bowel function. Knock back 2-4 teaspoons dissolved in water and you should have relief in 30 min to six hours. However: always talk to your doctor first. They LOVE a good chat about your bowel movements. A natural, low-priced exfoliant? Yes please. Mix a bit of Epsom salt into your favourite skin cleanser to give yourself an effective face scrub, massaging it into your skin in circular motions (and then rinsing clean). Or mix it with a body wash and use it as an exfoliating body scrub in the shower. Your skin will be softer than a kitten on a fairy floss cloud. So even though its name is a lie (maybe ‘Epsom Magnesium Sulfate’ was too much of a mouthful), get yourself a dose of Epsom salt soon. You’ll be glowing with health. Okay. Hard thinking time is over. You can remove your cap now.